I check out the various walrus-related videos on Vimeo from time to time. I’ll do a separate post about all the great stuff you can find there. But you should check out this short film – it’s a delightful, experimental film featuring a walrus far from home. NOTE: Walruses should really stop smoking, they have enough trouble as it is. The Walrus from Luke Randall on Vimeo. You have to check out the amazing article that is accompanied by the above picture, and several more, over on http://www.dailymail.co.uk. Taken from a plane about 20 miles out over the Chukchi Sea- which is pretty much walrus central. It must have been an unbelievable experience to see this in real life. 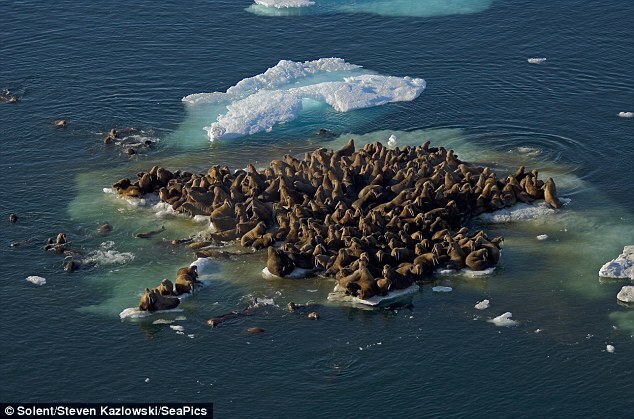 I mean, look at all those freakin’ walruses!! Check out this delightful post from Kimmy Helling on Oneworldoneocean.com’s blog. Charming pictures and video. Who says walruses aren’t cute? This is cribbed from http://www.drozfans.com/. Photograph © Andrew Dunn, 3 December 2004. The Cloisters: ‘The Game of Kings: Medieval Ivory Chessmen From the Isle of Lewis’ (through April 22) In 1831, a farmer on the Isle of Lewis, the largest island of the Outer Hebrides, discovered a lost cache of medieval chess pieces. Today, thanks to “Harry Potter and the Sorcerer’s Stone,” in which Harry and Ron play with magically animated replicas of them, the Lewis Chessmen are world famous. On tour from the British Museum, these adorable, bug-eyed little kings, queens, bishops, knights and warders, each beautifully carved from walrus ivory, are wonderful to examine up close. You don’t have to be a chess player or a Harry Potter fan to love them. 99 Margaret Corbin Drive, Fort Tryon Park, Washington Heights, (212) 923-3700, metmuseum.org. Here is the website of The Cloisters. I highly recommend a visit, walrus ivory or no. Here’s the Wikipedia entry on the Lewis Chessmen. 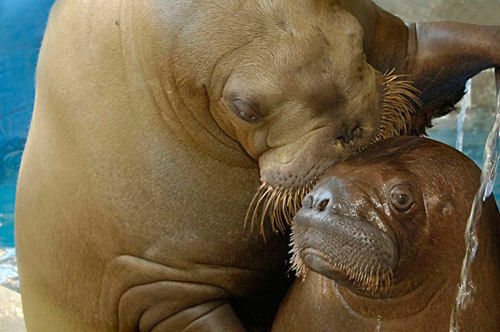 Walrus Pic of the Day: Don’t Look Now! This one’s cool on a couple of levels. First off, the video begins with Cab Calloway dancing to “Minnie the Moocher” in front of his band, busting some serious moves. The 1931 precursor to the moonwalk, the Crip walk, and James Brown’s dance moves all in one. This must have blown people’s minds back in the 30’s. The ghost walrus appears at 4:21. Kids today, they have no idea how surreal old cartoons were. Love this graphic. It’s from Deviantart, by stixman. I have posted about this program before, when it first aired, in this post. This embedded clip is a minute or so from the “behind the scenes” episode – this one is from a larger ABC News piece about the Great Migrations program. There’s some great walrus footage in here – it’s worth a look. I really wish I could find a way to watch this entire program online, but neither Hulu nor Netflix has it for streaming. I’m not paying Comcast even MORE money per month just to get National Geographic Channel. Guess I might have to hunt down the DVD. Oh no wait, check that, Amazon has it for download/streaming through Amazon Prime. $19.99 though! Spanish Artist Máximo Riera has created a very dramatic piece of art in his “Walrus Chair”, part of a larger series of animal-inspired art chairs which includes a rhino and a truly amazing Octopus. I would love to see this chair (well chaise lounge, actually) in real life. The scale of it and the apparent realism must be very striking indeed. The Walrus was drafted to accommodate the seats upon its back, merging into the animal, with a flawless compatibility. This fact gives a uniqueness to the composition. The artist wanted to preserve the real elevation of the animal, making the person who sits on it, share the same perspective. One of the most challenging aspects in this work, was the skin’s texture and consistency. The Walrus owns a natural volume and magnitude, attributes that makes him recognizable and distinct from any other species. It’s thick skin wrinkles and rests along its surface, this was a key element to have in consideration to prevent an artificial result. According to the silhouettes on Maxim’s press page – there are more animal chairs coming in the series. The page shows a place for a lion, a whale and a rhinoceros stag beetle! The sculptural elements of the chairs seem to be carved out of compressed foam. The site contains beautiful hi-res imagery of all of the chairs, as well as a well-designed PDF document about the entire series.